Srivathsan Srinivasagopalan is a Senior Architect at Cognizant. He works primarily on data science and network science – all on massive data sets. He holds a Ph.D. in Theoretical Computer Science from Louisiana State University, Baton Rouge. His research work was on deterministic buy-at-bulk network design algorithms. 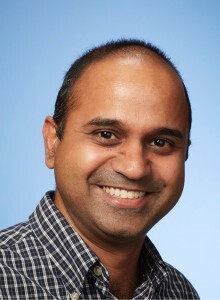 He has served as program committee member and reviewer for many top-tier Computer Science related conferences and journals – including IEEE Big Data, Journal of Parallel and Distributed Computing, IEEE Transactions on Computers, IEEE Transactions on Systems, Man and Cybernetics, IEEE Transactions on Control Systems, IEEE Transactions on Circuits and Systems, IEEE Systems Journal, International Journal of Distributed Sensor Networks (IJDSN), International Journal of Ad Hoc and Ubiquitous Computing (IJAHUC), IEEE Sensors Journal, Wireless Networks, IPDPS (IEEE International Parallel & Distributed Processing Symposium), IASTED and more. He has several book chapters on wireless networks and given invited talks at various institutes. His research interests include graph theory, machine-learning/artificial intelligence, approximation and optimization.